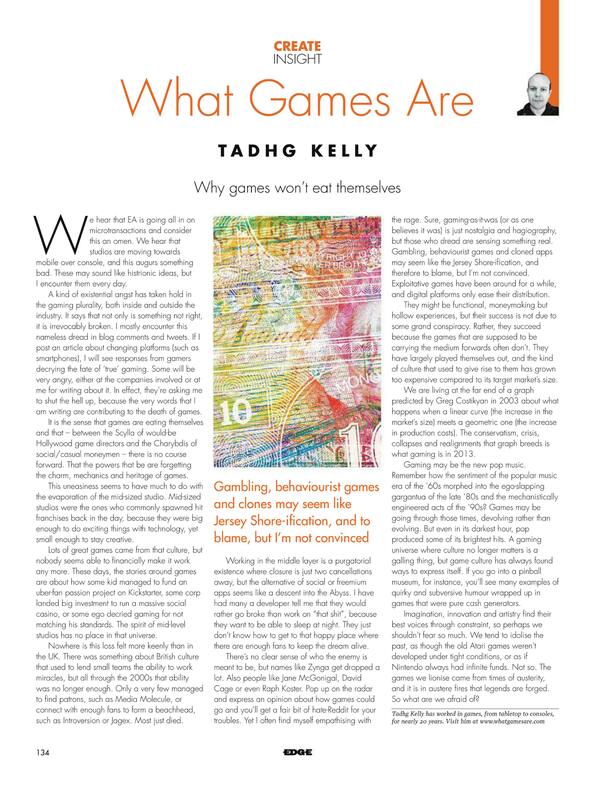 In this month’s Edge, a case was made by Tadhg Kelly against the general sense of dread that seems to accompany the news of moves such as the further incorporation of microtransactions into (typically EA) games and the borderline puritanical clamouring of “games are not what they used to be” from certain elements within the community, and that, further, games will be adapt to new commercial environments just as other media have. The perceived irrationality of this response, as described by Tadhg in his piece, will be rationalised here. It is sought that explanation be given to the phenomena elucidated upon in the article with a view to demonstrating that the opposite conclusion is true: games may well end up consuming themselves. The crux of Kelly’s argument is that the perception of the death of games as a meaningful enterprise is fuelled by what some perceive as the “Jersey Shore-ification” of games through the proliferation of behaviorist games such as those developed by the likes of Zynga and other “social” game creators. While these “games” may be “functional, moneymaking but hollow experiences”, their success is due not to any sort of true design for such success on the part of developers, but rather due to games that should be pushing the medium forward failing to do so (one example may be the disjunct between the mainstream gaming media’s love of Bioshock Infinite and the more critical outlook of the enthusiast press). With advances in technology over the course of the three decades of the games industry qua industry, costs have also become prohibitively expensive for developers, leading to “conservatism, crisis, collapses and realignments.” These elements, however, are of little concern for Kelly, with a parallel being drawn to the shift from the genuine passion for music in the 1960s morphing into the MTV-engineered pop music of the 1990s: if gaming is undergoing a similar evolution, for Kelly, there is little to be concerned with – in spite of any other goings on, honesty and passion in music has managed to shine through in underground movements, and will in games, just as it did even in cash-generating pinball machines. As an addendum, Kelly remarks that imagination, innovation and artistry find “their best voices through constraint” and that this has always been the way that games have operated. The conclusion from all of this is that games are and will continue to be fine, as they have been in the past. Perhaps the most troubling element of Kelly’s argument is what appears to be an almost throwaway comment towards the end of his article: the remark made about innovation being a function of tough times. While the aphorism of necessity being the mother of invention is a meme that has carried through generations, it is important to recall that innovation is not something that is unquestionably good. Necessity and its subsequent innovation is responsible in part for such devices ethically troubling in their use as weaponised smallpox and nuclear weapons. While making comparisons between such devices and the video game industry may seem crass, there is a valid point to be made here: just as innovation may lead to more engrossing worlds in games; novel gameplay mechanics; or new ways to tell stories interactively, it may also lead to ever more effective ways to convince players that pay-to-win is not only acceptable in terms of corporate ethics, but also that is the way that games should be played. While I will accept the point that Kelly makes about the success of the freemium model and other behaviourist innovations being essentially a happy accident that caught on, there is something that was missed in his analysis. Whether or not the success of these initial behaviourist titles for their developers is a result of savvy business acumen or not is an irrelevance: if such a title can be shown to be cheap to develop and deliver fair returns on investment, the nature of the landscape in which game publishing decisions are made changes massively. From being an innovative risk, the behaviourist route becomes the simple, rational choice for publisher sponsorship: it is cheap, delivers returns and in fact conditions players to expect to have to pay more for the game on top of its initial price – push button, get reward; hand over money, push button more often: a simple and deviously effective tool for the manipulation of human psychology. Many other endeavours, such any movement towards “traditional” games, become far more risk-laden. The assertion that restrictions are all that is required for innovation is also troublesome: social and cognitive distance between members of groups involved in the production of games will also serve as a factor in determining the extent to which any new product is “innovative.” Having white males of a similar age forming the groups that create games (as, currently, is ostensibly the case) will not lead to a great level of diversity in the end result. The crowding out of the market with brown-and-bloom first-person shooters is perhaps all the proof one will need of this. de Vaan, Vedres and Stark’s 2012 study shows that the distinctiveness (where distinctiveness is coded for by combination of 78 stylistic elements that they identify) of games is a function of cognitive folding (the incorporation of individuals in multiple, cognitively distant groups: a sort of group polarisation, the effect of which differs in whichever group an individual finds themselves at any point) and team size, with team size being negatively correlated with game distinctiveness at the p<0.001 level and cognitive folding associated positively with distinctiveness at the p<0.01 level. At a time where resources are limited in the games industry, it seems likely that the boon for genuine innovation in games is limited by the lack of cognitively diverse individuals coming into the industry: where jobs cannot be guaranteed in a fragmenting industry, it would seem safer to any individual who would consider going into games to either attach themselves to a “traditional” profession or move into the STEM space proper – perhaps an effect that would be made worse by traditionally female attitudes to risk aversion with regard to employment, where women are already under-represented in the industry and have more to worry about in terms of job security from areas other than the vicissitudes that face the industry as a whole (ie discrimination for being of child-bearing age and the rampant misogyny of the industry). Innovation, then, would be stifled by a lack of new and different blood coming into the fold. There are spaces, however, where we have reason to hope: indie development, though it never ceased, has come to the fore once again thanks to tools that have served to democratise game creation. Games will continue to exist, there is no doubt of that: man is a playful creature. The concern, however, is that for the industry outsider it may appear to be the case that all games are simply dressed-up Skinner boxes if the trend toward the commoditisation of in-game resources continues.